Posted: Thursday 25th April 2013 in Events and Awards, News. This summer Summit proudly sponsors the Summit Polo Cup 2013. On the 8th of June, the White Rose Polo Club will host the 8th annual Summit Polo Cup. Some of the finest polo players from all over the UK congregate in Yorkshire to battle it out for the illustrious trophy. Summit has sponsored the event for all 8 years and takes the opportunity to invite clients, partners and staff to attend. It’s a great day out for our clients and we hope that the time spent with our staff in a more relaxed setting helps build stronger relationships and enables the collaborative processes that we work in, day to day, become better as a result. 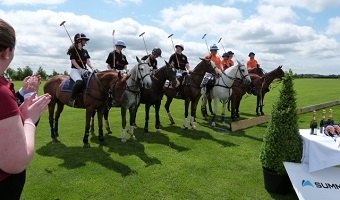 The day’s polo activities are also attended by paying guests. After the Polo glory has been taken there is a repose before Summit staff, guests, local councillors, neighbours and representatives from the media reconvene for the evening event and VIP dinner. The evening event (themed since 2007) is by invitation only. For the evening activities the White Rose Polo Club is completely transformed to match the evening’s theme. Fancy dress is donned and the revelry well and truly begins. 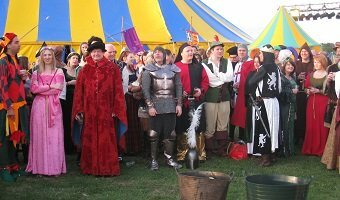 This year’s theme is Treasure Island, so break out the peg legs and avoid the black spot me hearties! Last year’s theme was the ancient Greek Olympics and other themes have included the Wild West, Arabian Nights and Casino Royale.